The American War of Independence (1775-1783) was a war of bravery, a war of sorrow. What can you tell me about the American War of Independence? It was a time when the original thirteen colonies in America joined together to break free from the British Empire and its king—King George III—who ruled over them. In the now famous Declaration of Independence the colonists declared they were at war with Great Britain and were now independent states and no longer a part of the British Empire. This is a painting of Sir William Pepperrell and his family, who lived in the American colonies over two hundred years ago right before the American War of Independence. 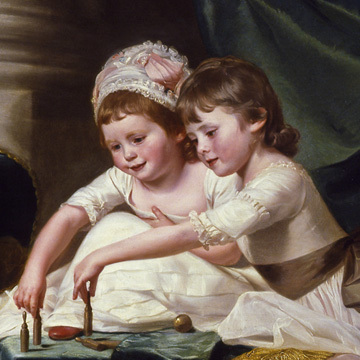 What clues are there in the painting that tell us about this family? The luxurious clothing, the Turkey carpet, the elegant furniture, the expensive silk drapery, the columns, and the large size of the painting tell us they were wealthy. What are some of the clues that tell us they lived long ago? They are dressed in old-fashioned clothes. Are they shown indoors or outdoors? The family is on a porch that overlooks a large park. Can you think of a reason why it would be important to show a park in a painting? It tells us that the patriarch of the family, Sir William Pepperrell, aspired to be a country squire. This mean he wanted to be shown in his family portrait not only as a man of great wealth and position but as a man of great leisure as well. The Pepperrells also must have loved their obediant dogs, because they included them in their portrait as well. This painting shows us a wealthy and happy family, correct? If you look closely, some of the details will tell you this family portrait is not all that it seems. How so? Look closely at the faces of the family. Does one of the faces seem ghost-like to you? Does Mrs. Pepperrell’s face look stiff? Are her eyes staring off into space? There is a reason for this. As it turns out, Mr. Pepperrell decided to sail away from America with his wife Elizabeth and their three daughters and only son. Why do you think Mr. and Mrs. Pepperrell and their children sailed away from America? Not all the American colonists wanted to break free from the British Empire and its king. Colonists like the Pepperrells were loyalists. This means they were loyal to Great Britain and their king. For this reason, the Pepperrells sailed away in exile from America. Sadly, Elizabeth Pepperrell died tragically during their journey from the American colonies to England. 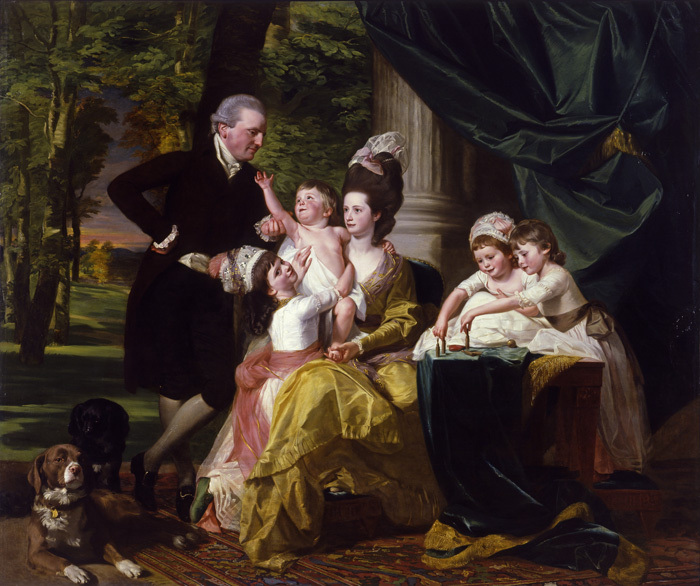 This portrait was painted after Mr. Pepperrell and his children had arrived in England, after Elizabeth had died and after they had lost a great deal of their wealth and land in the American colonies. 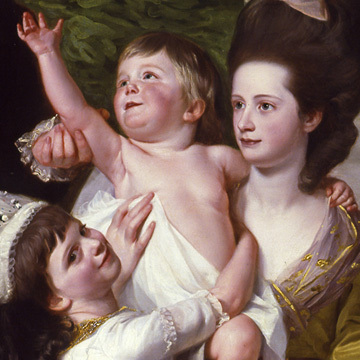 To include Elizabeth in their family portrait, the artist Copley had to model Elizabeth’s face from memory, as he had painted a picture of her when she was a girl, or perhaps he modeled her face from an earlier portrait of her. Why do think Mr. Pepperrell wanted a painting of his family the way they were before his wife had died and before they had fled their homeland? Perhaps Mr. Pepperrell wanted to have a painting that would remind him of a happier time. There is another sad thing about this painting. Look at the toddler on Mrs. Pepperrell’s lap. Is he the focal point of the portrait? Do we focus our attention on him? Yes, we do. What elements in the composition make our eyes look at him? He is in the center. His mother is holding him up to his father. His sister is embracing him. Why would the artist make the only boy the focus of the portrait? As the only boy, he would have inherited the family fortune and would have carried on the family name and title. Sadly, he died when he was young. Knowing what you now know about the Pepperrell family, what would your title for this painting be? On a happier note, here is a photo of a family who came to the museum to see this painting of Sir William Pepperrell and his family. They were interested in seeing this painting, because Sir William Pepperrell was their great-, great-, great-, etc. grandfather! Does the man in the photo look like Sir William Pepperrell? Look at their chins. They look exactly the same! What about the boy in the photo? Does he look like the toddler in Mrs. Pepperrell’s lap? Look at their ears. What about the other children? Do they resemble one another too? Do you have any paintings or photographs of your family? If so, do you look like them or like similar things? Yes? No? Perhaps you don’t bear any resemblance at all to other members of your family. Perhaps you are unique. 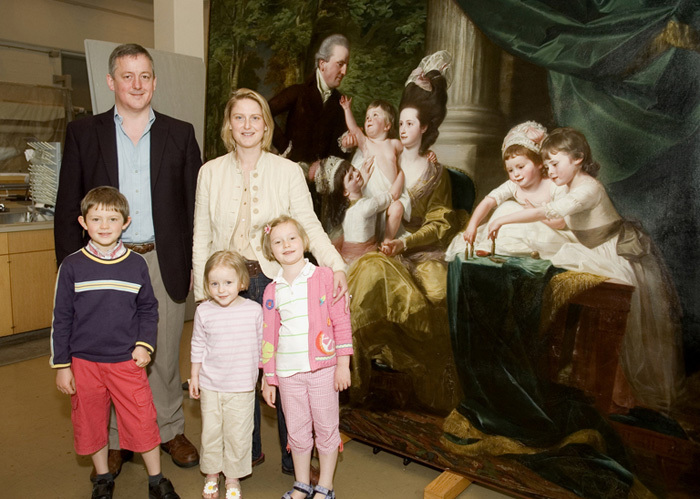 Descendents of Sir William Pepperrell with the family portrait by Copley during a visit in 2007, courtesy of the North Carolina Museum of Art. Would you like to see Sir William Pepperrell and His Family in person? All you have to do is visit the North Carolina Museum of Art in Raleigh, North Carolina. Sir William Pepperrell and His Family is in the Portrait gallery at the museum. Or perhaps you would like a tour. Tours of the collection are given daily, except for Monday when the museum is closed to the public. If you prefer, you can contact the museum ahead of time and arrange for you and your friends to have a private tour. I’m sure a docent at the museum would be happy to show you and your friends Sir William Pepperrell and His Family and many other works of art. Whether you visit the museum on your own or have a tour with a docent, it will be well worth your time!